Cafe Veranda (formerly Cafe on the Ridge) is the signature dining outlet of Taal Vista Hotel. The all-day dining restaurant offers a wide array of local and international specialties to suit every preference. A sweet bonus? 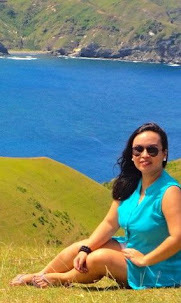 A spectacular view of the Taal Lake and Volcano on the foreground! On a recent visit to Taal Vista Hotel, we had the chance to try out Cafe Veranda's famous weekend lunch buffet, a la carte signature dishes at dinner, and the expansive breakfast buffet the morning after. We arrived at the restaurant a little past 12 noon. By this time the restaurant was quite full already for lunch, so it's a good thing we have a table reserved for us ahead of time. If you're planning a visit especially on weekends, better call and reserve in advance. There was the Bughaw Dance Group performing a sort of Igorot dance when we entered the dining hall. If you have friends coming to the Philippines from abroad, bring them to Cafe Veranda on weekends for them to sample exquisite heritage cuisine and be entertained with an exciting cultural show. It's one of the best in the country (been to several boring, worse ones actually, but this one is wayyyyyyy better). As soon as we settled our stuff at our table, we checked out the many buffet stations to see what we could savor for lunch. I headed straight to the salad and appetizer corner where I got a few pieces of smoked salmon. It was love! Tagaytay is also known for fresh vegetable produce, so if you love veggies (unlike me, so sorry!) don't miss out the crisp greens and homemade dressings at the salad bar. Depending on the season, some of the greens are fresh from the hotel's own backyard farm. After getting our appetizers, we went back to our seats and ordered drinks. I got a freshly-made pineapple shake and hubby had his old-time favorite watermelon shake. Orders came in promptly. Next, I went around to look for the heritage fare on offer. There was a station with dinuguan (pork blood stew) and puto (rice cake), fresh lumpia, and turon (banana flambe in pastry wrapper). I opted for the dinuguan since it is one of my favorite Filipino dishes. While some might get grossed out by the idea of eating blood, I, on the other hand, enjoy it a lot! (Well, I'm sure I'm not a vampire, don't worry). The stew was so flavorful sans the dreaded "bloody" aftertaste. The rice cake was the perfect accompaniment. There is also a sugba (Visayan term for "grill") station where I got grilled prawns and mussels. There are meats, too, like pork, beef and chicken. What surprised me a lot was the giant grilled fish that's even bigger than the roasted pork belly on the carvery. It looks monstrously delicious! The rosemary roasted chicken tastes like your grandma's heirloom slow-roasted chicken recipe -- very homey and familiar. The Mongolian barbecue station was also inviting, with the aromas of meat, seafood, veggies and spices circulating around the place. A bowl is so hearty so you might want to slow down or get just half a serving. I was about to get my fair share of Mongolian barbecue when my eyes landed on this...Paella Valenciana!!! Of course, I did not waste a single moment and grabbed a plateful! It was oozing with flavors and the chorizo combined with prawns and other toppings were heavenly. While we were still gorging on paella and pork belly, Akisha asked me to get her some desserts. To my delight, the dessert station was full of sinful finds -- cream puffs, truffles, fruit tarts, pavlovas, meringue, mousse, and a lot more. Plus, there was a halo-halo station perfect for that Pinoy sweet ending. There were fruits, too! Taal Vista Hotel has an in-house fruit carver so don't be surprised to see mermaid-, dragon-, and bird-shaped fruits at the buffet. So talented their carver, I must say! For dinner, we stayed away from the buffet for us to sample Cafe Veranda's signature a la carte dishes. To start with, I ordered fresh buko juice which was not so cold but sweet than usual nevertheless. I asked for some ice cubes and it turned out fine. For the mains, we ordered Taal Vista Sizzling Bulalo (slow-cooked beef shanks smothered with mushroom gravy and demi-glace) and Tagaytay Bulalo Soup (beef shank simmered for hours in rich broth with corn and other vegetables). If you'll ask me which one is better, I'd go for the sizzling version as I was able to savor the flavors of the bone marrow more than in the soup version, but I am sure purist and conservative foodies would still prefer the soup over the sizzling one. Both have fall-off-the-bone tender meat and tasty broth/gravy, and are served piping hot. Tawilis is a freshwater sardine endemic to the Taal Lake and in Tagaytay and the nearby towns. It is often served crisp and lightly battered. At Cafe Veranda, the Crispy Taal Lake Tawilis is served with vinegar, freshly minced garlic, crushed peppercorn, chili and crispy kangkong (water spinach). The Chicken Inasal (grilled chicken marinated in soy sauce , lemongrass, garlic, annatto oil and local spices) may not be as famous as the bulalo and the crispy tawilis, but it sure deserves a spot on the table. The chicken was tasty inside out, though can be a bit dry when left untouched for too long. To complete the Filipino dining experience, try Cafe Veranda's version of pinakbet (vegetables sauteed in shrimp paste). The veggies were not overcooked and the sauce smells delicious! I don't eat veggies, though, but hubby seemed to like it that much. For kids, there's a wide array of child-friendly dishes to choose from. Akisha chose drumsticks and French fries. We saved the best for last, of course. For desserts, we had Cafe Veranda's famous turon leche flan and Volcano (a chocolate lava cake served a la mode). I LOVE them both. The turon was not too sweet, and the perfect combination of crunch and rich, milky custard-like filling was to die for. The Volcano turned out to be Akisha's favorite -- it's a good mix of hot chocolate cake oozing with fudgey chocolate syrup and cool vanilla ice cream. We all wiped the plate clean. The next morning, we woke up early to have breakfast before we go for a dip in the pool. Our first station? BACON! This is such a blockbuster as the tray gets empty so fast! These crisp, fatty version is just so yummy to eat with plain or garlic rice and sunny side up egg. Bacon is God's greatest gift to the breakfast table, agree? I also requested for a ham, mushroom, bacon, and cheese omelettte, which I ate together with the flaky croissant. For the mains, a friend recommended that I try the iconic tapang Taal (marinated beef). And she was right, it was worth the mentionas the tender beef cutlets are loaded with local spices that is not too foreign to my Pinoy taste buds. There was also the crispy dilis which is a perfect match to champorado or congee! Aside from the sinful bacon strips, I also heart Cafe Veranda's smoked pork loin. It's the first runner up actually, as the slices disappear into thin air in a snap!